Modern fire alarm systems are aimed to detect fire and to spread alarm to staff on-duty and to the surveillance panel for quick fire isolation. For effective operation, such systems should be correctly designed, with due consideration of current regulatory documents on fire safety, concerning object characteristic and customer wishes, in view of architectural concept and premises interior design. Each such project undergoes expert review in State Fire Supervision authorities, concerning reliability and safety. After that, it is put into effect. The annunciators detect fire source and transmit signal about it to the control panel. Depending on the peculiarities of premises and its purposes, the smoke, heat, fire and combined announciators can be installed. For explosive objects, the explosion-protected annunciators should be used. 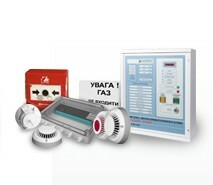 For protection of the objects of any complexity (from private apartments and houses to huge industrial enterprises, shopping and leisure centers, banks, hotels and other crowded buildings) the BK Company uses equipment of famous Polish producer Polon Alfa, in particular, address fire alarm systems POLON 4000 and non-address ones – IGNIS. Fire alarm systems POLON 4000 is developed for protection of big and important objects, in particular, equipped with BMS (Building Management System). Each and all equipment of 4000 series are notable for ease of handling and mounting, simple programming and high informational capacity of read messages. At the same time, wide range of linear-loop components (annunciators, control elements, connection units, address annunciators-sirens etc. ), possibility of combining into hierarchy structure, availability of remote control and display terminal of TSR-4000 type, and enormous amount of other various functions make system POLON 4000 really universal tool, by dint of which it is possible to design and to carry out reliable fire protection systems of any complexity. For small and medium size objects BK Company offers non-address fire alarm system on the basis of fire alarm control and indicating equipment of IGNIS 1000 type. Its distinctive feature is possibility of start-up of extinguishing system in automatic and manual modes, as well as process control. Moreover, we offer equipment of German company BOSCH: for the objects of different purposes – address systems FPA-5000, for small and medium size objects – FPA-1200. Module structure of fire alarm control and indicating equipment and large quantity of interface modules, annunciators in different modifications, innovative engineering and design solutions, as well as Ukrainan and international certificates (VdS) allow to adapt effectively fire alarm system BOSCH for requirements of any object. developed by SEVEN © 2008-2019 All rigth reserved.